The tuning fork has a very stable pitch and has been used as a pitch standard since the Baroque period. The "clang" mode has a frequency which depends upon the details of construction, but is usuallly somewhat above 6 times the frequency of the fundamental. This is close to the first overtone of the clamped bar. The clang tone dies away rapidly. The two sides or "tines" of the tuning fork vibrate at the same frequency but move in opposite directions at any given time. The two sound waves generated will show the phenomenon of sound interference. 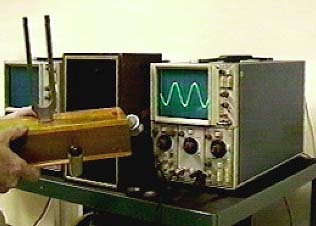 The tuning fork sound is picked up by the microphone and displayed on the screen of an oscilloscope. Once the fork has settled down to its fundamental mode, it produces a sine wave trace on the oscilloscope.